Even though Marianne von Knobelsdorff was born in Germany, her heart is in Glebe. During the 29 years since she arrived here, she has been an indefatigable worker for The Glebe Society and has participated in most of the major campaigns that have been waged to preserve and improve our suburb. As most members know, Marianne is returning to Germany to care for her sick mother, but has retained her flat in Leichhardt Street in the hope that she may return one day. In the busy days while she has been packing she found time to record her memories of Glebe. Extracts have been published in Bulletin 3/2003, and further extracts will appear in later Bulletins. We have published the full text here for those who are interested in the details of Marianne’s remarkable career in Glebe. I arrived in Sydney on 11 April, 1974 after 2 years individual overland travel from Berlin/Germany with one friend through Israel, Cypress, Turkey, Iran, Afghanistan, Pakistan, India, Thailand, Laos, Malaysia and Singapore. It was a miracle that I did not die of some disease, was not killed and did not end up in a harem, as it was already arranged. Being Good Friday, everything was closed in Sydney, nothing to eat for dinner. I got a job as a Travel Agent straight away, without any experience in this field. No certificates or references on me to show. No contract, $70.00 wages per week, training on the job. Instant dismissal with one week’s pay if I would not perform. What a difference to Germany, where I had already worked at the German Institute for Economic Research in Berlin and the Free University at Berlin for 7 years. In 1975, I moved from a rented “shack” in Kirribilli to Glebe on the recommendation of John Borg, my boss, who was born in Glebe. “Close to the city” he said. Christel Salat, a German client of mine and long term Glebe Society member, took me to The Glebe Society’s Christmas Party in the Glebe Rowing Club in 1975, signing me up straight away as a member of The Glebe Society. In 1976, I bought my unit in Leichhardt Street, even though firstly I was rejected a loan, being a woman. As profession, the bank put down ‘spinster’. “If you want to stay in Australia, you must own your own home”. This was new to me too, as most people in Germany rent all their lives, being highly protected. Another adventure, which proved to me being absolutely necessary in the Australian Society. In 1977, John Borg and I opened our own Travel Agency. Being a Company Director as a new immigrant in a foreign country was challenging and exciting. In 1978, Eric Gidney, a neighbour opposite in Cook Street and a Glebe Society member, got me involved in fighting against the foundry in front of us in Cook Street. The German National Television came and documented everything. So I still got the foundry and me collecting signatures on video. For the first time, I attended a meeting at Leichhardt Council. I loved it. Never heard of an “Open Council”, introduced by Aldermen Nick Origlass and Issy Wyner, before. You actually could get up and have your say! I cherished this Open Council and made lots of use of it in future years, addressing the Mayor and Aldermen with certain issues. The verdict by Council on the foundry was that the owners of the foundry should extend the ugly chimney high up to something like 30 metres, so that the black dirty stinking emissions would be emitted higher up. Later I heard from Robyn Mackney, the president of the Glebe Rowing Club, I fought ‘with together against the proposed boat repair shop and proposed marina at 29 Cook Street, and a relative of the family who owned the old foundry, that Council might have imposed these conditions, knowing that the 100 year old foundations would not be strong enough to support such a heavy chimney. With relief I heard that she thought that it was a blessing in disguise for the owners as they sold the land and were “forced” to retire. The land was subsequently rezoned ‘residential A’! A typical example for the gentrification of Inner City suburbs, particularly for Glebe, which used to be a Waterfront Industrial Working Class suburb. In 1984, there was a meeting on the same site with the developer, architect and residents to discuss the proposed residential development for 18 townhouses (23-25 Cook Street). As the meeting was, as it generally happened, scheduled for 4 pm, i.e. during office hours, I took a taxi from work in Surry Hills. We managed to redirect half of the traffic away from going into and up Cook Street which would have been ludicrous. Having come from a country which has more bicycles than people, I joined a small group of bicycle enthusiasts and together we founded LBUG = Leichhardt Bicycle Users Group which is part of the Bicycle Institute of NSW, in approximately 1989. We have been working for improvements, input into Leichhardt Council’s Bike Plan and into the RTA. My dream I have been pursuing during workshops and meetings is to have bicycle routes along the foreshores of Rozelle and Blackwattle Bay into the City. I remember one of the meetings around 1991 with the then Mayor Larry Hand, the town planner Bruce Lay and Robert Moore from LBug in the Bar Italia in Leichhardt. (The Bar Italia was depicted in the film “Rats in the Ranks” in 1996 as one of Leichhardt Council haunts). A highlight was the launch of the new Leichhardt Bike Plan in the carpark of Leichhardt Townhall with the Mayor Maire Sheehan in 1996 where an abandoned Volkswagen was artistically spray painted. As I was the only one who had actually arrived on a pushbike, they filmed me for a promotional film around Australia, which I have unfortunately never seen. At one of the first committee meetings, which were held at Lyndhurst (saved by Glebe Society members from destruction to make way for the planned Freeways in the early 70s), I was given the task of organising a Ferry Ride. I said “A piece of cake’, having been a Travel Agent, but not anticipating the enormous amount of work, organising these events for The Glebe Society. I drew on Betty Wright’s experience. In 1991, I was asked also to organise The Glebe Society’s Christmas party at the Glebe Rowing Club. The books always have to balance too. Anyhow, everybody, including Sandra Nori with her 2 small children, enjoyed the ferry ride and picnic on Rodd Island on 12 March in 1989. Later on, I was talked again into organising another “Rocket” Ferry ride together with Ian Edwards which started from the Fishmarket on 13.9.1998, partly to promote a regular ferry service for Glebe. The opening of the Bicentennial Park with fireworks on 17.12.1988 made a lasting impression on me, particularly having heard all the difficulties John Buckingham, convenor for the foreshores, had to overcome during the 16 years to get us this park. After that I developed a great interest for the foreshores, joining The Glebe Society Foreshore Committee which produced “The Bays and Foreshore Policy” in 1991. One day I got a call from the Sydney University asking me if I would like to give a speech in front of 55 architectural students as part of the course “People in the Urban Environment”, having chosen Glebe as a good example. I did that on 1 March 1990 in the architectural building. It was a block of concrete without windows. The air conditioning had broken down so that we had to open the door. What an example of urban architecture! Since the mid 70s, the battle was on for the Blackwattle Bay Park against Parkes Development. This was a joint effort of The Glebe Society, local residents, the Foreshore committee, the Builders Labourers who, under Jack Mundey, imposed the ‘Green ban’, and other bodies. We have been able to enjoy the marvelous result since the official opening of the park on 7.8.1983. The fight was extremely well organised with a pyramid calling system. People planted small trees and stood in front of the bulldozers as shown on the front page of the Sydney Morning Herald the next day. The fate of Bellevue, the Italianate villa built in 1890 with sweeping views over Blackwattle Bay, is a sad one. The residents who created Blackwattle Bay Park, saved Bellevue from demolition by the developer which then went into Council’s ownership in order to keep it for the public. Apart from a new roof some years ago, it has been allowed to deteriorate further. Together with Charles Plumridge, Glebe Society member and former owner and restorer of ‘The Retreat’ situated next to it, and other nearby residents, we have been fighting against a large commercial development for several years. The developer of a proposed restaurant on the site was actually promised by Council to have part of the park for car parking. This developer luckily just disappeared. I had a large input into the Plan of Management of Blackwattle Bay including Bellevue, commissioned by Leichhardt Council in 1999. Still, nothing has happened, but at least the residents, through the Management Plan, are protected from a large commercial development, and so is Blackwattle Bay Park. In early 1989, a DA (development application) was brought before Council for a boat repair yard and long marina at the bottom of Cook Street, hence known as “29 Cook St.” Andrew Wood, then President of The Glebe Society, Robyn Mackney, President of the Glebe Rowing Club, and myself formed a little team in 1990 and fought tooth and nail against this unsuitable proposal in a now medium density residential area. We had meetings with Bruce Baird, then Minister for Transport, and Max Moore-Wilton, better known as “Max the Axe”, head of the Maritime Services Board. There was another flaw: During the Land and Environment Court hearing, only the land portion, i.e. the proposed boat repair shop, was dealt with, ignoring the adjoining marina, sticking far into Blackwattle Bay impeding the rowers. As the marina was water based, it was out of their jurisdiction. Recession set in and it became financially unviable to build a boat repair shop. It became more lucrative to go for a residential development. After the wish of the residents had been granted by Council to rezone this land from “Industrial Waterfront” to “Residential and Open space” a DA for a residential block was received by Council. This DA went straight to the Land and Environment Court as it had not been dealt with by Council in the prescribed time, which I think was something like 40 days. This was called “deemed refusal”. Council had been totally bogged down by the huge problems in Balmain where approximately 7 large industrial sites were supposed to be rezoned residential. Again, I was representing The Glebe Society in the Land and Environment Court. Sandra Nori supported our aim to obtain a foreshore walk for the public, which the developer tried to deny us. My shattering experience was that the barrister on the other side only tried to make you contradict yourself and thus being discredited. We were unable to change the cluster of the building, but made improvements along the Cook Street side. The greatest achievement was that the developer had to hand over the foreshore strip of approx 15 meters to Council, i.e. to the public, with a clear demarcation fence. Hopefully soon the foreshore access will be extended along the John Fletcher’s site, in which I have been involved for over 10 years, starting with a private meeting with Mr Garner sen., the owner then, in the late 80s. For at least 10 years as far back as I can remember, I was involved in the Rozelle Bay Working Party, initiated by the Save Rozelle Bay Campaign Group with Tom Dan and Hall Greenland, fighting against a 500-berths marina in Rozelle Bay. The report was presented to Council on 2.6.1992. The marina was dead and buried, then it raised its ugly head again, fought off again and so it went on. In each meeting I attended, it was established repeatedly and unanimously passed that the bays should be kept as a quiet oasis for “passive” activities only for rowing craft and a refuge for the Rowing Clubs, the bays being lake like with quiet waters and “no wash zone”. Apart from the “Super Yachts” marina which was supposed to be there only during the Olympic Games period in 2000, it has been fairly quiet on the Western front until now. In April 2003, we hear of a plan by the State Government to build a $2 million boat ramp at the Northern side of Blackwattle Bay on vacant land underneath the Anzac Bridge, which could accommodate up to 90 power boat. Some residents, hearing of my involvement in the community concerning issues, asked me to help them to do something about the noise and disruptions caused by the Backpackers at 250, 254-256 and 258 Glebe Point Road, since the conversion from Boarding Houses. In one meeting with residents and Council on site in 1989 or 1990, Issy Wyner, the Mayor then, threatened the operators to close them down. When the owners lodged a DA for extension, it got to the Land and Environment Court in September 1992 and was rejected. By then, I certainly had gained enough experience representing The Glebe Society. Andrew Wood, previously Vice-President, was elected to President in 1989. He spoke to me that he has to go to Melbourne for work sometimes and asked me if I could fill in the vacant position of the Senior Vice-President and chair the next meeting. He assured me that I could resign anytime. Under that condition I accepted and it lasted for more than 4 years up to the AGM in 1994. During one of those days, when he was in Melbourne, I represented him during discussions about saving the houses in Catherine and Arundel Streets which the University had purchased and wished to demolish in order to create the “Mandelbaum” College. Luckily they were saved, as the lifts which were required for physically impaired people, could not be afforded.It had become apparent that the Glebe Markets in the school grounds of the Primary School at Glebe Point Road had become a nuisance for the residents regarding noise and traffic. I suggested to the organiser to compromise and instead of having the Markets every Saturday and every Sunday, i.e. every single full weekend, just have them on Saturdays only, in order to give the residents some peace and quiet on Sundays. In 1994, the Land and Environment Court ruled exactly this. Sometimes I think a mediator would do a better, faster and cheaper job than the Land and Environment Court. In 1992, Ted McKeown “sacrificed” himself to become President. He had been everything else so far. As everybody knows, the President can only stand for 2 terms maximum, i.e. 2 years. Now came the problem: We could not get a successor. The years 1993/94 were difficult, particularly for me. I felt I could not fill the shoes of a President with all the responsibilities which go with it, apart from my 60 hour a week job. I did as much as I could, collected the mail daily, read it, photocopied the important things and distributed them to the “right” people on my bicycle. I shared the load with dedicated Peter Strickland and Ted McKeown, supported by Jeanette Knox who has been a pillar of strength throughout for many years as Secretary. I chaired the meetings at times, had meetings about saving the Homoeopathic Hospital for a library and arranged the 25th Glebe Society’s birthday party/AGM at Darling Mills on 28.8.1994. I invited Prof. Bernard Smith, the founder of The Glebe Society, and flew him from Melbourne, to honour him and to be our guest speaker. I delivered the first and hopefully last Vice-President’s “Year in Review”, which, I think, was far too long, but so many things had happened or had not happened. In 1994, the part restoration of the Glebe Diggers’ Memorial was launched. Bill Nelson and Max Solling had done a wonderful job. Sandra Nori was asked to plant a rosemary, then Bill Nelson asked me to plant the 2nd rosemary. I was very touched that he had picked me, being German and the enemy in the 2 World Wars. Or was it just that girls had to do this task? Who could forget the ongoing saga about the poplars? The lovers and haters of the majestic poplars lining part of Glebe Point Road, breaking up the footpaths and threatening to fall down being at the end of their life expectancy had all different ideas like to replace the poplars with other species, native or deciduous? Or to replace the old poplars with new poplars? Soon after I moved to Glebe in 1975, I was told “Watch out for any poplars being cut down. Ring Council immediately”. One became a poplar watcher. When, after decades of discussions, a decision had to be reached, Council commissioned a “Streetscape Management Plan”. Most of us thought that the previously suggested replacement trees, particularly the huge dark ones, were unsuitable. Ted McKeown had the wonderful idea to hire a minibus and to look at trees. That was a great event. We wanted our poplars back, and so it happened at least near the Point. Surprise: a less aggressive species of poplars had been discovered and Council started (was it in 2000 ?) to stagger the replacements. In 1994 we managed to reintroduce the Ward system. How did this happen? John O’Connell, a long term Glebe Society member, who used to live in one of the townhouses in Cook Street/cnr Glebe Pt Road, convinced me that the wards should be reintroduced. I brought it up at The Glebe Society committee meetings which was agreed to, among everybody really, by Neil Macindoe, who, as a Councillor, presented it to Leichhardt Council. A vacancy had happened through the unfortunate death of Cr Nick Masterman which required an election and at the same time, the Ward system was reintroduced. As Glebe will be joined with the City Council on 8 May 2003, unfortunately, the Ward system will be finished once more. Furthermore, City Council is not an “Open Council” what had been part of our community life in the Municipality of Leichhardt. In 1994, Atene Gardens, 23-25 Cook Street, the townhouses on the old site of the foundry mentioned earlier, proposed to put up electronic steel gates to block off any pedestrian traffic. The residents Paul Elliott and Sally Bongers of Sheehy Street, fought the proposal and I followed it up with Council in l995 when there was still a nasty sign “Private property, trespassers will be prosecuted”. As Council could prove that it was legally a “right of way”, their Body Corporate was very supportive and replaced the signs with a lovely one “Pedestrian thoroughfare to Sheehy Street”, which is actually a nice pedestrian short cut into the city. In 1999, Leichhardt Council was looking for pocket parks and land to sell off to decrease their debts. I made clear to them not to touch the little park dividing Leichhardt and Stewart Streets. They had their eyes on the narrow nature strip called “George Street” which acted as a buffer between 29 Cook Street and said townhouses on the old site of the foundry in Cook Street. When Council’s surveyors came to view the parcel for Council to sell it off for residential development, I supported the residents against this move, as even thinking about it was ridiculous, impeding on their privacy and overshadowing. Also in 1999, I got, with Neil Macindoe’s help, who was still a councillor, a beautiful sandstone garden bed with agopanthas at the bend of Leichhardt Street, replacing the ugly road blocks, which had been broken up many times before. When Neil came along Leichhardt Street to inspect the problem, Bob Armstrong, living opposite, complained to him as well. As Leichhardt Council has magnificent sandstone buildings, sandstone steps and still original sandstone gutters, I got very concerned when ‘Leichhardt Lodge’ was up for auction on 19.8.2000. It had not been included in any heritage listing whatsoever. I undertook one week’s research of the building, mainly at Sydney University, where there are 5 volumes of a thesis by Craig Anthony Burton “Housing in Glebe”: Architects, Builders & Styles 1828-1915, published in 1981, including this building as part of the “Golden Estate” which consisted out of 4 buildings built by Michael Golden and his son, including “Margaretta Cottage” next door. Leichhardt Lodge, previously called “Bayview”, was actually built from valuable sandstone from the Pyrmont quarry. Luckily, it was not bought by a developer, but by a family who has been restoring it since magnificently. Now it just needs to be heritage listed. In 2001, some of us local residents fought a DA in Leichhardt Street which proposed to use the de facto pedestrian connection from Leichhardt Street down some sandstone steps to Stewart Street as a private driveway. It was saved. The ‘Harbour Lighterage” site redevelopment off Oxley Lane at the Point went on for many years. One day in 1992, I heard that the old fashioned picturesque tug boats were to be auctioned off. I went quickly down to take photos. Next day they were gone. The tug boats had belonged to the Adelaide Steamship Company which belonged to Brambles which had gotten into financial difficulties. On 24 September, 1992, I went to the auction where the land together with the title underneath the water was sold off cheaply. After the land had been rezoned “Residential and Open Space”, the architect showed us a long boring square residential apartment block drawn up for the site. Over the years until the Land and Environment Court hearing in 1996, we the local residents and precinct committee managed to break the block up and make it look better. It took 18 months alone just for the excavations. Now we can enjoy a beautiful walkway along the foreshore of that building. Another long saga at the Point, maybe for 20 years was the so-called “Fink Building” at the end of Glebe Point Road facing Rozelle Bay. It was a huge land with complicated different zonings occupied by many various buildings, housing different companies incl. a wooden boat building shop, previously Hardy’s Timber Yard. The “long” building, an old shed, was rented out to various artists, not complying with the zonings. I realise that some residents in the small houses opposite were disturbed by traffic noise associated with the usage of the building. However, I thought that the “Blackwattle Studios” were a fantastic accumulation of dynamic art studios full of character. I loved the casual Blackwattle Bay Cafe with sweeping views over the bays and Anzac Bridge. I also liked to sit on the benches at the water’s edge. All gone! In 1999, Council was threatened with a Land and Environment Court hearing and the majority of councillors gave in, mind you, after having been worn out by 10 years of fighting about it, into Mr Fink’s proposal. In a totally different matter, I was very concerned about the loss of membership of The Glebe Society. In 1998, Ian Edwards, then Convenor of the Foreshores, found out that the Society had lost 40 % of its members in only four years. I took on the task to regain those members, as I found out most of them did want to stay on as a member, but could not keep up somehow with the yearly renewals, being inundated by other memberships and by paper in general. We managed to get a lot of the lost members back and attract new ones, partly through the street stalls which Andrew Wood, and later Christine Whittemore and myself organised up to September 2001 proudly displaying “The Glebe Society Banner”, organised by Alison McKeown. (After 10 years of intense fighting against the 3rd runway, Alison had to give up the Aircraft convenorship). In September and October 1998, I also supported Christine, Convenor for Environment, in her talks with Glebe residents in the Noora Cafe on Glebe Point Road. I thought it was great fun. Having lived in Leichhardt Street since 1976, part of the Municipality of Leichhardt, and being a Tourist Guide for mainly German speaking visitors, I became interested in the life of the German explorer Ludwig Leichhardt, who had come to Australia in the 19th century. He contributed enormously to the exploration of Australia through several dangerous expeditions. Unfortunately he vanished without a trace with all his men and equipment on an expedition from south to north in 1848, the year of the revolution back home. In 2001, I visited his birthplace Trebatsch, South-East of Berlin in former East Germany. There is an active Ludwig Leichhardt Society with a museum which holds monthly lectures about Australia. I was warmly received by members of the Ludwig Leichhardt Society and the Mayor, to whom I handed over Max Solling’s and Peter Reynold’s book ‘Leichhardt on the Margin of the City’, which I had signed by the then Mayor Kris Cruden. To conclude, I really like the village character and community spirit in Glebe, represented by The Glebe Society. I believe that The Society is primarily an Action Group through which one has a voice which is highly respected and listened to, and one can fight for things one believes in, thus making an impact and a change. It also provides a close knit community with lots of social activities and friendships. I have enjoyed the events I did organise myself as well as the many events many other members of the Society have organised. 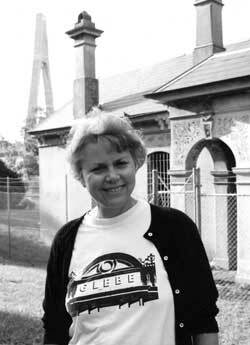 I am thinking there of the yearly Glebe Society birthday and Christmas parties, sometimes at the Glebe Rowing Club before it folded, or at Darling Mills, even Lyndhurst, the biannual Inspection of the Glebe Historic Houses, for which Cynthia Jones worked her heart out. I always thought I was blessed having been invited into so many private houses to functions like Happy Hours, dinners, progressive dinners, or even a cup of tea and a biscuit or a freshly baked muffin on a Sunday afternoon. I will miss all this when I am leaving Australia on 29 April this year, but on the other hand it is quite exciting to revisit Europe again which I had left 31 years ago. I wish The Glebe Society, its members and my friends well in the never ending battles and I am sure they will uphold “eternal vigilance” particularly now as Glebe is going to be transferred to the City Council. If you have a contact address for Marianne, would it be possible to pass on my details to her, please? I met her in 1975 and my youngest daughter, born in 1982, now resides in Glebe with her young family.